What times do the bands start? Gates open at 4 p.m. bands start on small stages then. Headlining bands start later. We do not release the exact start times for headliners. Go here for the full lineup. 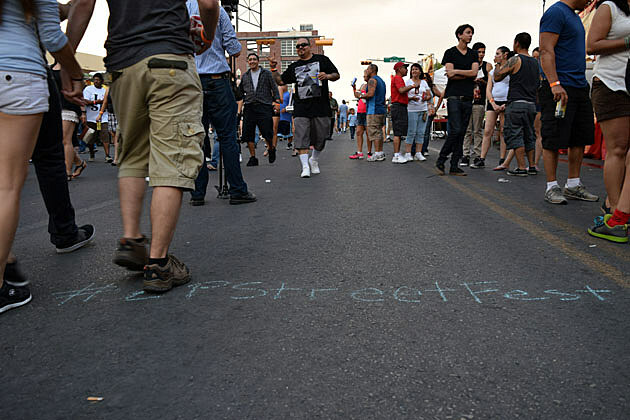 Are there age restrictions for general admission to StreetFest? No. Anyone is welcomed to attend. Children under five are free. Kids 5-12 are $5. Everyone 13 and older is regular price. Are there age restrictions for the VIP section? Will there be a car show this year? Yes, the car show will be hosted inside the Convention Center and will have over 200 cars on display from around the nation. Yes! StreetFest is filled with amazing food. We’ll have a list of all the vendors here shortly. Approximately around midnight each night. Professional recording equipment including large, professional, detachable zoom lenses, any drones or other commercial equipment. There are several parking lots and spaces around downtown El Paso. Most will cost you a few dollars. Parking in the Convention Center will be available, but fills up fast. I can’t go. Do you offer refunds? No. We’ll be there rain or shine and hope to see you. If you can’t attend, you can always give your tickets to a friend. No refunds will be issued. Media passes can be requested here.